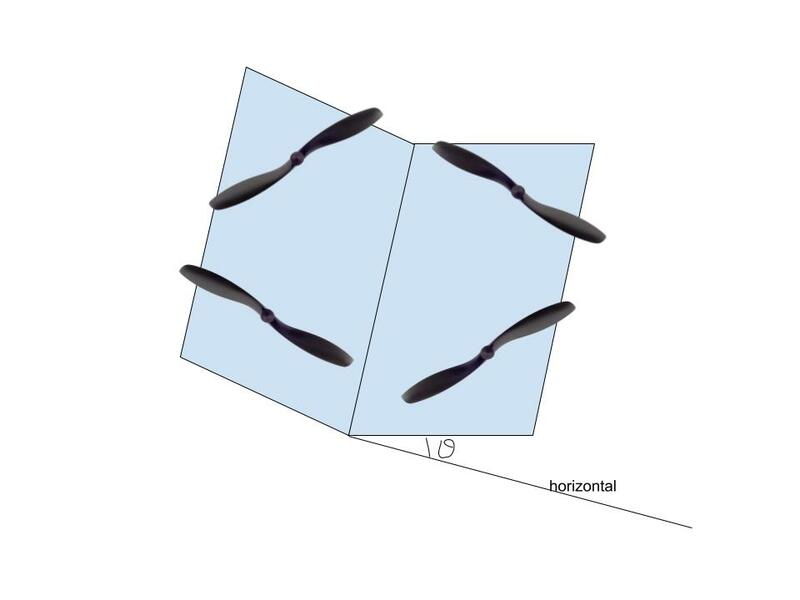 Can quadcopters still fly with propellers at an angle? Can quadcopters still fly with propellers at an angle? By this I mean like the whole motor mounts will be situated along a certain slope (so as to be neither horizontal nor vertical). I don't think that's how most drones fly, if the surfaces the motors are on are folded in a way that resembles a flying motion of birds or butterflies. Yes, you can. But it very depend with the angle (as in your drawing). If it is "folded) to make V-shape (that will make divergent thrust), then will reduce the lift compared to if the angle is opposite direction (inverted V-shape), which will make the thrust become convergent, it will produce more thrust. Both will work, but one is better than another. See this Akagi Helicopter. But the angle should not be high enough. There is research that researching eagle and bird shape. There are two kind of bird or eagle's shapes. The 1st is the wing feathers trailing edge is divergent, which is make it look like V seen from the head. The 2nd is, the wing feathers trailing edge is convergent (closing to the tail, so it look like V seen from the tail, not from the head). From the research, the 2nd is better than the 1st in maneuvering and speed. But in slow move (like surveillance), the 1st is better as the flaps are produce less speed and power for the same amount of flapping (power). Another thing, the power of the flapping of the 1st is divergent, leaving the bird/eagle body, while the power of the flapping of the 2nd eagle is concentrated beneath the body (convergent) that make amount of lifting power. Unfortunately I can not find the video in Youtube. Maybe later. So, have the propellers mounted at an angle to each other? Sure, it'll still fly. Normally, the propellers of a quadcopter all produce thrust in the same direction, and all of the thrust contributes to holding the quadcopter up (and to rolling and pitching it, depending on how fast the propellers are going relative to each other). If you angle the propellers into a V or something, then the propellers will produce some thrust in concert with each other and some thrust in opposition to each other. So, part of the thrust will contribute to holding the quadcopter up, and part of the thrust will serve absolutely no purpose at all. The result: the quadcopter will still fly, but it will waste some energy as it does. I'm not aware of any advantages to having the propellers angled like that. There is also the cost aspect to consider. It is far less expensive to alter the speed of the propellors than to tilt them, which involves heavier, swiveling mounts, plus extra motors or servos to swivel the propellers and motors, and more power needed to lift the extra weight and counter the loss of lift. Note that on aircraft, propellers are always perpendicular to the direction of travel, to maximize the thrust they produce. Even true of tilt rotors, which typically operate with the rotors either vertical or horizontal, except when in transition from hover to forward flight and back. Not the answer you're looking for? Browse other questions tagged propeller unmanned-aerial-vehicle angle-of-attack quadcopter or ask your own question. Is it possible to fly horizontally with zero angle of attack? What is the typical angle of attack aircraft fly at and at what angle of attack do they stall? Can drone with two propellers above one another fly vertically upward without spinning?